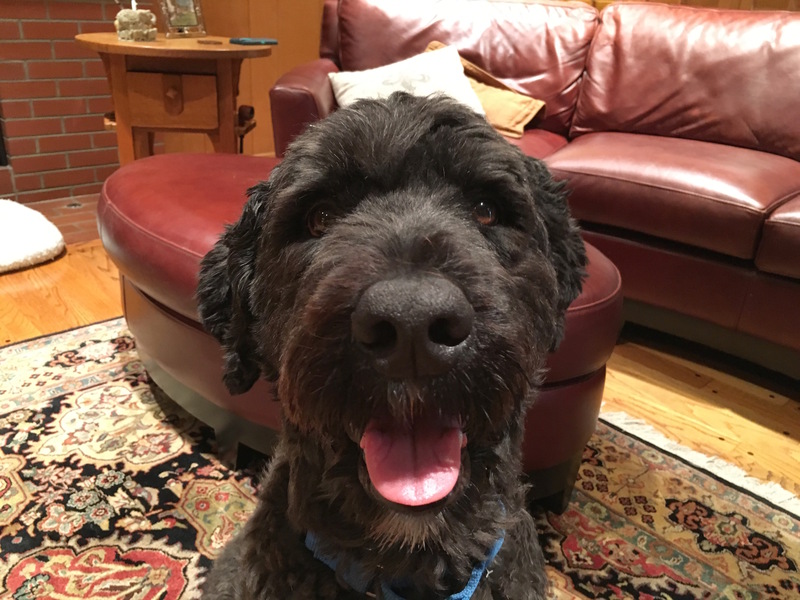 Brel is a four-year-old Bouvier Flanders who gets over excited at times, especially around their guardian’s six-year-old grandson. When I sat down with his guardians to talk about what they wanted to accomplish, I noticed that Brel didn’t respect any personal boundaries. The dog went wherever he pleased, this included getting right in the face of his guardians. When he came over to me intending to do the same, I showed his guardians how to disagree with this behavior in a way he responded to immediately. In addition to being a little too nosy, I noticed that Brel didn’t always take notice of his guardians. This was most apparent when they moved around the room. The dog didn’t move or make any effort to get out of their way. As a result the guardians had gotten into a habit of moving around the dog instead of the dog moving around to accommodate the human. While it may seem like a little thing, this interaction told me that the dog didn’t see his guardians as authority figures. Brel basically considered everyone in the house to be equals. I showed his guardians how a simple activity like moving his toys can be used to start asking the dog to move out of their way, instead of the human moving around the dog. Another way to help change how the dog sees and identifies his authority amongst the group is to not let him up on the furniture for a month. For dogs, the higher they sit, the more rank or authority they feel. By letting Brel sit at the same height, his guardians telling the dog they were on the same level. To help Brel transition to the new no furniture rule, I showed his guardians how to use positive reinforcement to condition him to go to his dog bed on command. While we were finishing up the dog bed exercise, Brel’s guardian mentioned that he tried to hump her when she is doing yoga. I had her get the mat so she could go through a few positions and trigger the behavior. It didn’t take long before Brel saw an opportunity and tried to mount her. The instant he started to jump up, I made a sharp and loud hissing sound to disagree. As soon as he heard it, Brel stopped immediately. This was due in large part by the timing of the hiss. While the intensity is important (And something his guardian needs to work on), its stopping the dog before he gets started that most important thing. I suggested his guardian practice pretend yoga so that she can be watching him and ready to respond instantly. If her timing is good and the hiss intensity is enough, she will be able to stop him cold. The dog will be persistent, but after a week or so of this instant disagreement Brel should stop. Being able to disagree this way is a skill that will be very useful in the redefinition of the leader follower dynamic. They will only be able to disagree with the dog’s behavior with their grandson if they can first stop unwanted behaviors with themselves. A great way to help the dog see his guardians as authority figures is to have them take over the door greeting. This will be even more important due to Brel’s excitement at the door. By claiming the space around the door and moving the dog away before opening it, his guardians can help Brel stay calmer and also see them as having more authority. When we set and enforce boundaries, we are acting as a leader in the dog’s eyes. By the end of the session, Brel was already showing more respect for the guardians leadership. He was responding to corrections immediately and taking their direction without hesitation. Brel isn’t a bad dog, his guardians just hadn’t communicated to him exactly what they did and didn’t want in a way he understood. Now that everyone is on the same page, it shouldn’t take long for Brel to settle down and follow their lead.